DEAR GAIL: We’re in the process of redecorating and looking to work through our house one room at a time. We want to start with our dining room as we like to entertain. We’d like to seat as many as possible but don’t know the shape or size we should look for. Can you give us any guidelines? — Denise A. When selecting a dining table, use the room's size and shape to guide your choice. DEAR DENISE: There are so many shapes and sizes of dining tables. Since this is a large purchase, you’re wise to consider all of your options as well as what will work best in your room. The style and design of your table is important, of course, but making sure it fits your space and gives you enough seating is even more critical. Since you entertain it’s important that your guests can sit comfortably and still have ample space to walk around the table. For some people a dining room is just about looks and is occasionally used once or twice a year. Even though space is still important in those cases we sometimes break the rules. First, your table should be at least 36 inches wide so you have enough space for place settings as well as food. To help make sure you have ample and comfortable space consider the following measurements. Walk around room: To be able to sit down and get up easily from a seat, try to leave from 42½ to 48 inches between your table and the walls, with an absolute minimum of 36 inches. This also applies if you have furniture against your walls. Elbow to elbow: Each person needs about 2 feet of eating space to be comfortable. Of course, for those occasional times when you have a large gathering and you’re able to squeeze in another chair go for it. It’s better than sitting at the kids table. Knee to base: Your table base is an important consideration, especially when you’re looking at a smaller pedestal base table. Pedestal-base tables do accommodate more people than a leg base, but there is nothing worse then pulling your chair up to the table and hitting your knees against the base. Try to have at least 30 to 36 inches from your knees to the back of the chair when sitting at the table. 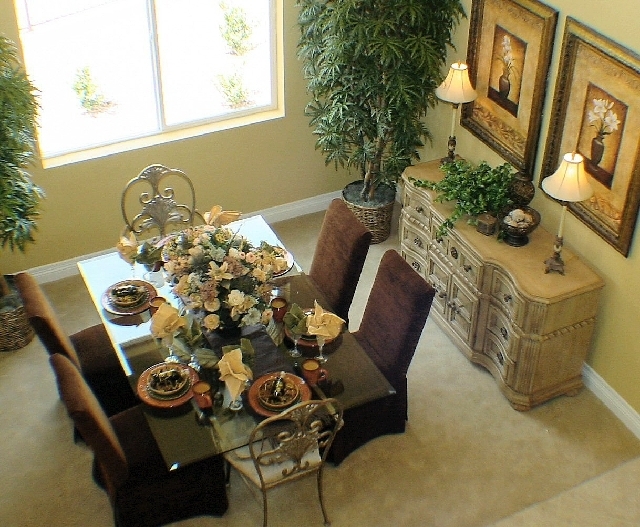 If your room will not accommodate a table large enough for your average number of guests, consider a table with a leaf. Look for one that has a self-storing leaf so you don’t have to get it in and out of the closet or out from under the bed each time you entertain. As far as the shape, look to the shape of your room for direction. In a square room you can use either a round or square table. Round tables are nice as they allow everyone to talk to each other instead of having to look around the person you’re sitting next to. Round tables also seat more people than a square. Plus, if you have a pedestal base, no one gets stuck with the leg when you bring in an extra chair. In a rectangular room, a rectangular or oval table works best. If you happen to have a large rectangular room, you also can do something very different and use two round tables. If the room is narrow, I would suggest an oval to cut the hard narrow lines of the room. If you have an odd-shaped room or prefer glass, you can, of course, have any size piece of glass cut. But I must caution you about the size of the base. It must be large enough to safely hold the glass top. This is extremely important with a glass top because you have no way of securing the top to the base as you do with a solid top. With a glass top you also have to be aware of the tipping factor. If the top is not heavy enough and the base is not the proper size, there is a chance of tipping the top if someone leans on one side. And, most importantly, take the time to test out different shapes and sizes in your room. How can you do that? Make a template out of cardboard, newspaper or even an old sheet. Bring in your kitchen, folding chairs and patio chairs. If you’re considering a pedestal base, draw it out on your template. Then, when you pull the chairs in, you can see if you have ample knee space. I know this sounds silly, but I can’t tell you how many people purchase the wrong size table and then are stuck with the table or restocking fee, if they’re even lucky enough that the store allows returns. So get your tape measure out and have fun shopping.